Medical device manufacturer, Bedfont, who has specialized in breath analysis for over 40 years, has announced a new and improved 2nd generation NObreath®. The FeNO monitor will be launched exclusively at ERS, the world’s largest European Respiratory Society Congress, which takes place this year September 15-19th in Paris. 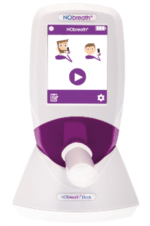 The 2nd generation FeNO monitor is launched after the recent publication of the NICE guidance on Asthma: diagnosis, monitoring and chronic asthma management, to improve asthma care, which included the NObreath® FeNO monitor from Bedfont as a recommended device. To celebrate the exclusive launch, the second-generation family business will also be holding a competition at their stand where delegates will have the chance to be entered into a prize draw to win a new NObreath®.